After replacing my decrepit old smoker with one that was actually temperature controlled and insulated, I went on a crusade to learn how to cook acceptable smoked pork ribs. This richly spiced delight is what I finally landed on; the rub is pretty heavy on paprika but has a little sweetness from brown sugar. The meat almost falls from the bones and the fat is cooked to perfection. 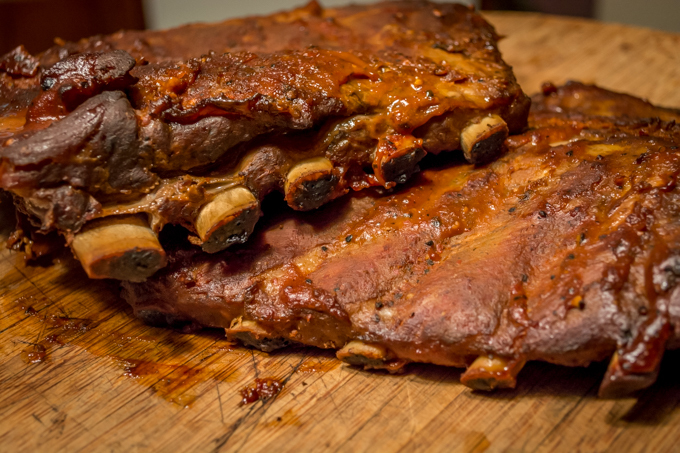 This recipe involves cooking the ribs in stages over about a 5 to 6 hour period, but it is well worth the wait, especially since there isn’t much to do except add more wood chips to the smoker once you get going. You will need to prepare your ribs the night before you are going to smoke them. In order to do this, flip the ribs concave-side up and peel off any clear membrane that you may find along the inside of the rack of ribs. If left on, this stuff can get pretty tough during the cooking process. One easy way to remove it is to peel up one edge of it with the edge of a spoon, grab and peel it away from the bones and meat, rocking gently from side to side. If you are lucky, it will come off in one sheet, but usually it comes off in two or three chunks. After the membrane is off, coat both sides with mustard and generously apply the rub. Work it into the nooks and crannies of the meat and seal the whole thing up in a bag to refrigerate overnight. The next day, get ready to smoke some ribs! This is about one of the laziest cooking styles known to man; it is not complicated, just leave yourself plenty of time. Get your smoker ready by setting the temperature at about 220 degrees F. It is really beneficial to have a smoker with a decent thermostat and they are not expensive. Put your ribs on an upper rack, seal the smoker and smoke for between 2 1/2 and 3 hours. During this phase of cooking, you will want to keep the smoke rolling by adding wood chips. For my smoker, this needs to happen about every 20 minutes, depending on the size of the wood. Also, keep the vents pretty closed up to retain the smoke, temperature, and some of the moisture. Once the time is up, remove the ribs from the smoker and place them in a cleverly crafted boat of aluminum foil. Partially fill the boat with beer or some other such fluid, seal it up and return it to the smoke to cook for another 2 hours or so. There really is no need to add wood during this stage of the cooking, since the ribs are sealed up. Make sure to double the foil on the bottom (or use a tray), to avoid leaking beer all over the place. This stage of cooking will thoroughly cook and soften the ribs, resulting in a really succulent final product. For the final stage of cooking, remove the ribs from the foil, return them to the smoker and smoke with plenty of wood for about 45 minutes to an hour. Open up the vents on your smoker a bit to encourage air flow and dry the ribs a bit. Don’t worry, they will still be plenty moist. This final stage of cooking just serves to set the ribs up a little bit. I find that without this step, they are a too moist and not firm enough. When set to your satisfaction, take your glorious, smoky ribs out and set them on a board (well back from range of questing dog tongues) to rest and firm up just a bit more. That’s it…done. Oh, to the left is one of the sauces that I use for pork barbecue. Our friend Star absolutely loves this stuff and I included the recipe for it at the bottom of the page so the she doesn’t hunt me down to get it. It is plenty spicy, mildly sweet, and has a nice punch from the cider vinegar. It also has the advantage of being readily thrown together from ingredients that are available in most households. Enjoy as-is or feel free to adjust to taste. 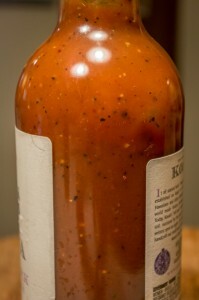 Barbecue sauce is a highly individual thing that takes a little bit of tinkering to get just the way you like. Let us know if you come up with a good variation or already have a sauce that you prefer. The night before smoking, prepare the ribs by removing the backing membrane and coating the rack with a thin layer of prepared mustard. Generously apply the rub mixture to the meat, seal in a plastic bag, and refrigerate overnight. When ready to smoke, set the smoker to 220 degrees F and place the ribs on one of the upper racks. Smoke for about 2½ to 3 hours, adding wood chips as needed. Vents on your smoker should be about ¼ open. Remove ribs from the smoker and place in a boat of aluminium foil. Pour in 1 beer (or apple juice if you prefer) and seal foil. Return to smoker and continue cooking for about 1½ to 2 hours. To finish ribs, remove from foil, return to smoker and smoke for an additional 45 minutes to 1 hour in order to dry the outside. Add wood chips about 2 to 3 times during this process. The vents on your smoker should be open about ½ way or more to allow a little air flow. Remove ribs from smoker, allow to rest about 10 to 15 minutes and serve. Combine all ingredients in medium sauce pan. Bring to simmer over medium heat. Reduce heat and simmer, covered, for about 15 to 20 minutes. Remove from heat, cool and pour into bottle for storage in the refrigerator.